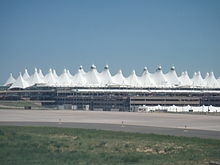 Opened in 1995, Denver International currently has non-stop service to 205 destinations throughout North America, Latin America, Europe, and Asia; it is the fourth airport in the U.S. to exceed 200 destinations. It has the second-largest domestic network, with 185 U.S. destinations. 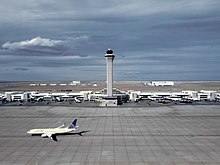 As of 2018[update], DIA is the 20th busiest airport in the world, fifth busiest in the U.S. (by passenger traffic handling - 64,494,613 passengers), and the largest in the Interior-Western United States. In May 2018, construction began on a 12-gate expansion to the west end of Concourse A. The first five gates are expected to be completed by June 2020 with the remaining project to be completed by December 2020. Some of the new gates will be additional gates capable of handling larger wide-body aircraft for international flights with direct access to U.S. Customs and Border Protection. In early 2018 a temporary concourse extension opened at the east end of A. This will be primarily used by United Airlines for regional planes while work to Concourse B - that requires demolishing a 12-gate regional finger on its east end making way for a second regional jet concourse - takes place. This extension to Concourse A is expected to be removed in late 2020 once construction work to Concourse B finishes. When finished, gate capacity in Concourse A will be increased by nearly 32% to 50 gates.